“A Bad Day for America”: Anti-Nuclear Activist Harvey Wasserman Criticizes Obama Plan to Fund Nuclear Reactors | Democracy Now! independent journalist and longtime anti-nuclear activist. In the early 1970s, he helped found the grassroots movement against nuclear power in the United States. He is the editor of nukefree.org and is a senior adviser to Greenpeace USA. 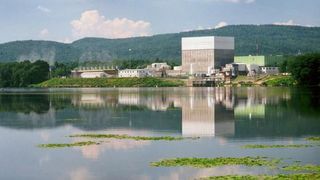 StoryAug 28, 2013In Victory for Activists, Entergy to Close Vermont Yankee Nuclear Plant; Will More Follow? JUAN GONZALEZ: President Obama on Tuesday pledged $8.3 billion in loan guarantees needed to build the first nuclear reactors in nearly three decades. The move, along with a tripling of nuclear loan guarantees in the President’s budget, represents a new federal commitment to the nuclear power industry. Obama made the announcement after touring a Maryland training facility for energy jobs. PRESIDENT BARACK OBAMA: We are announcing roughly $8 billion in loan guarantees to break ground on the first new nuclear plant in our country in three decades, the first new nuclear power plant in nearly three decades. To meet our growing energy needs and prevent the worst consequences of climate change, we’ll need to increase our supply of nuclear power. It’s that simple. This one plant, for example, will cut carbon pollution by 16 million tons each year when compared to a similar coal plant. That’s like taking 3.5 million cars off the road. JUAN GONZALEZ: The $8.3 billion loan guarantee will help the Atlanta-based Southern Company build two more nuclear reactors in Burke County, Georgia, near the city of Augusta. The loan guarantees will cover up to 70 percent of the company’s portion of the project’s costs. The Energy Policy Act of 2005 authorized the Department of Energy to issue up to $18.5 billion in loan guarantees for new nuclear plants and other energy projects. President Obama wants to triple the size of the loan guarantees to $54 billion. AMY GOODMAN: Harvey Wasserman is an independent journalist, longtime anti-nuclear activist. In the ‘70s, he helped found the grassroots movement against nuclear power in the United States. He’s editor of nukefree.org and is a senior adviser to Greenpeace USA, joining us by Democracy Now! video stream from his home in Ohio. Harvey, welcome to Democracy Now! What is your response to President Obama’s proposal? HARVEY WASSERMAN: Well, basically, complete horror. This is a terrible decision. It’s a bad day for America, a bad day for Obama. There’s nothing that’s happened with nuclear power in the last thirty years that’s made it any more palatable, any more reasonable economically. There’s no solution to the nuclear waste problem. We were on a path for a green revolution, where the jobs really are for the future of this country and where our energy supply can come from without ecological disaster. And here, the Obama administration is going with a failed twentieth century technology. It’s completely counterintuitive. And it’s a very, very bad day for America. JUAN GONZALEZ: And Harvey, the issue both of the disposal of nuclear waste from these plants as well as the safety of the plants themselves? HARVEY WASSERMAN: The plants are no safer than they’ve ever been, and there is no solution to the nuclear waste problem. So, you know, it’s a double whammy here. We have technologies that will work, that will provide the jobs that we need for this country. And Obama has gone in completely the opposite direction. And I will tell you that the environmental movement, in general, is very unhappy about this. There will be tremendous resistance to this plant and to all the other ones that this administration may try to build. It’s quite indicative that, after all these years, the nuclear industry cannot get private financing for these reactors. They have to go to the federal government. And they can’t find Wall Street support or other independent support to build these reactors, because the reactors are not economically viable. And you’d think, after all these years, they’d have made enough progress at least to get even private insurance. The reality is that these reactors will be underwritten, in terms of liability, by the taxpayer. God forbid if there’s a mass accident at any nuclear power plant, including these, there will be only the federal government as an insurer, in case of liability. An astonishing statement on the technology — can’t work and will never work. And it’s a terrible mystery as to why the administration has taken this bad step. AMY GOODMAN: Harvey, we’re calling you on the telephone just to get a line going. Harvey Wasserman is editor of nukefree.org and senior adviser of Greenpeace USA. He’s written the book Solartopia! : Our Green-Powered Earth, among other stories — among other books that he’s written. And we’re talking about President Obama’s announcement of the initial $8 billion in loan guarantees for construction of the first new nuclear power plants in the United States in close to three decades. Why do you think, Harvey Wasserman, that President Obama has done this? Who is he serving here? I mean, even the Heritage Foundation remarked, “Expansive loan guarantee programs are wrought with problems. At a minimum, they create taxpayer liabilities, give recipients preferential treatment, and distort capital markets.” So you’ve got progressives, you’ve got anti-nuclear activists, you’ve got the right-wing Heritage Foundation — they’re all opposed here. Who is he serving? HARVEY WASSERMAN: Well, this is a big difference now. Not only the Heritage Foundation, but the Cato Institute and the National Taxpayers Union, these have all come out against these loan guarantees for fiscal reasons. And the fact is that the economic reasons, the economic basis for building nuclear plants, is worse than it ever has been. So we really have no explanation for this. You have to remember that the Obama administration started off with Van Jones and a whole program for green jobs, and it’s abandoned that now in favor of going with a failed technology, nuclear power. The environmental movement is committed to stopping this. And we will do the best we can. The reality is that we’re in the midst of a green power revolution. Solar, wind, tidal, geothermal, ocean thermal — all these technologies and, most importantly, increased efficiency — are moving ahead tremendously. And yet, there’s just no, you know, indication here that the administration has gotten the message that these are the technologies that need to go ahead. And it’s interesting, because we started off with Van Jones. We started off with an industry that was going to make these strides forward. And now we see a complete reversal on the part of the Obama administration. The only explanation we have is that Obama was an Illinois politician. He was backed by Exelon, which is a major nuclear utility. And he seems to have basically completely abandoned the premise on which he was elected, that he would lead a green power revolution. And now he’s gone to an obsolete, dangerous technology with no solution to the nuclear waste problem. You know, Amy, he’s established a commission. JUAN GONZALEZ: Harvey, if I can, you mentioned the issue of Exelon, and I think that when you say that folks in the progressive movement are surprised, I wonder how surprised they should be, because I remember back during the presidential primary writing a column about the close ties between Exelon — Exelon is not just a nuclear power industry generator, it’s the largest operator of nuclear power plants in the United States. I think it has seventeen. And the firm was a major — has historically been a major backer of President Obama. And two of his chief aides have ties to Exelon. Rahm Emanuel, as an investment banker, helped put together the deal that eventually merged, created Exelon. And David Axelrod was a lobbyist for Exelon. So there are very close ties between the chairman of Exelon, John Rowe, and the Obama administration. I think even Forbes Magazine listed it, talked about those ties. So I think that the President was very equivocal on the issue of nuclear power during the campaign, but that there was no — there seemed to be — the industry believed he was going to be their salvation. HARVEY WASSERMAN: Well, he’s certainly come through for his backers at Exelon there. And it’s a tragedy for him and for the administration, but most importantly, for the American people. We’re seeing the corporate interests flooding through this administration, getting pretty much what they want. And in this case, Obama has done a tremendously destructive about-face of taking the technology of the failed — of a failed technology from the twentieth century and trying to use taxpayer, ratepayer money to foist this on the economy. One thing about the selection of the Georgia site is that this — the reason they’re doing this in Georgia is because the ratepayers in Georgia are being forced to pay their share or the state’s share of this plant in advance. And so, you have ratepayers being essentially taxed by their rate-setting administrations to pay in advance for reactors that may never be built. The minimum that these plants will take to build is six or seven years, probably more than that. We’re seeing massive overruns already in a construction project in Finland and another one in France. It really boggles the mind to see this administration going down this path. But we will resist, and we will fight them. There’s a huge fight going on, by the way, in Vermont right now, where the people of the state of Vermont are trying to shut the Vermont Yankee nuclear plant, which has been leaking tritium. And if you’re not aware of this, twenty-seven of the 104 nuclear plants in the United States have been confirmed to be leaking tritium now. These are plants that have been around for twenty, thirty years. If they can’t control more than a quarter of the operating reactors in the United States and prevent them from leaking tritium, what are they doing turning around with this technology and pouring many more billions of dollars of our money into it? It’s an absolute catastrophe, and we will stand up to it. AMY GOODMAN: Is this a done deal? And we have fifteen seconds. HARVEY WASSERMAN: Absolutely not. We will be resisting these reactors. We will resist this funding. We will do our very best to prevent this construction from going ahead. The environmental movement is very focused on this. And this is — no way, shape or form — a done deal. AMY GOODMAN: Harvey Wasserman, I want to thank you for being with us, editor of nukefree.org, senior adviser to Greenpeace, book Solartopia! : Our Green-Powered Earth. In Victory for Activists, Entergy to Close Vermont Yankee Nuclear Plant; Will More Follow?